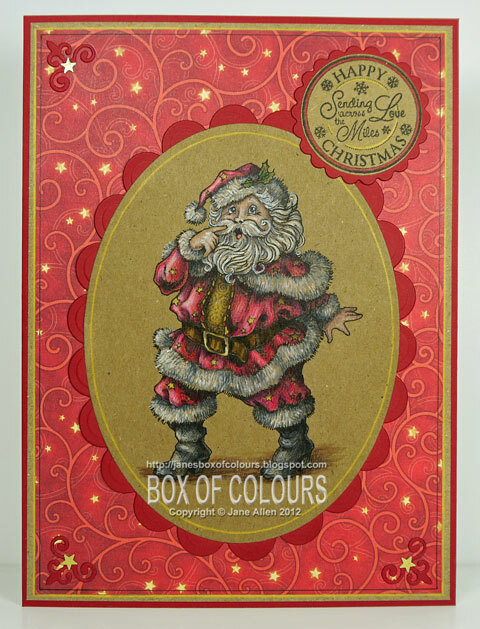 Jane's Box of Colours: Ho Ho Ho Here comes Santa! Hello there one and all! 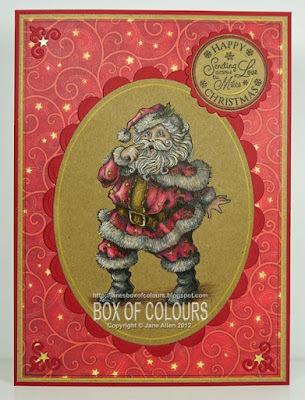 Do you remember me mentioniong the blooper I made when making my Without Words DT card for the December challenge? and I had an absolute blast with all that fur!! Wow, stunning colouring Jane! Love the papers and corners too! Ooohh Jane he's an awesome Santa, and coloured to perfection as always, he's a proper old fashioned Santa, kinda like how I imagined Santa to look when I was little :-). Have a wonderful Christmas hun. Oh my!! what sublime colouring Jane, he is just incredible, my jaw's still on the floor here! Hi, Jane! Another awesome card....I love what you've done with the fur! Truly amazing colouring! 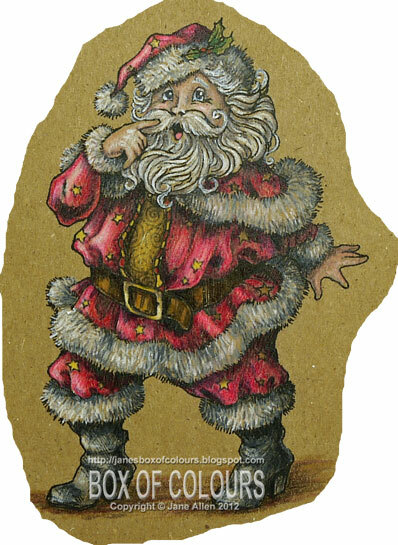 Seriously the colouring on this card is way to fabulous.. You are such a talented colourer-inner lol.. I love the way you have matched the colours to the kraft to make the colours pop. I have been staring for ages wondering how you made the texture on the fur..
Gorgeous coloring of the image, Jane! Thanks for joining the Sweet 'n Sassy Digi Challenge this week. Magnificent...I'm sure Santa has never looked so good! Oh wow he's awesome too! I'm so jealous of your pencil work. sigh....mine are gathering dust. This is fabulous Jane! Hugs! Your coloring is absolutely amazing!! Wowzers!!! Thanks so much for playing along in this week's Sweet 'n Sassy Digi Challenge. Merry Christmas! What a great card for Christmas! Thanks for joining us at Pattie’s Creations Design Challenge. I need to remember to give myself waaaay more time to noodle around your blog...I always get carried away looking at your amazing creations! THIS is OUTSTANDING! Like I've said before, your work is so inspiring! Thanks for sharing! I love this card! Your colouring is absolutely fantastic! Thanks for joining the challenge at Eclectic Ellapu - sorry I'm a little late, the new challenge is up now and we'd love to see you join us again! A lovely christmas creation. Thanks for sharing with us at Dream Valley and good luck.